Irene Nowell's work would be both impressive and important if she were "only" a masterful Scripture scholar or a gifted spiritual guide or a compelling teacher. The fact that she is all three makes her an extraordinary resource for Christians today. In Pleading, Cursing, Praising, Nowell puts all of these gifts to use to offer a guide to praying with the psalms. Nowell maintains that the psalms teach us to tell our story, to cry out our pain, and to give praise to God. They also teach us to listen—to the voice of God, the voice of Christ, the voices of the people around us, and the voice of all creation. This book includes questions and exercises for personal reflection, brief prayers for praying along the way, and suggestions for composing one's own psalm-prayers. It promises to enrich the spiritual life of everyone who reads it. Irene Nowell, OSB, is a member of the Benedictine community of Mount Saint Scholastica in Atchison, Kansas. She served on the translation team of the revised Old Testament of the New American Bible and the Committee on Illuminations and Texts for The Saint John's Bible. Nowell is a past president of the Catholic Biblical Association. She is the author of Numbers (of the New Collegeville Bible Commentary), Sing a New Song: The Psalms in the Sunday Lectionary, and Women in the Old Testament, all published by Liturgical Press. I loved this book. . . . It is very readable. . . . This book is perfect for those who are new to the psalms. Nowell does not presume that the reader knows anything about the psalms. She writes clearly and simply about the psalms to draw one into the topic. Consequently, someone new to lectio divino, the Liturgy of the Hours, and/or spiritual direction will find this book a valuable source. . . . Though this book is perfect for newbies, there are many things that are valuable for people who have been praying with the psalms for years. 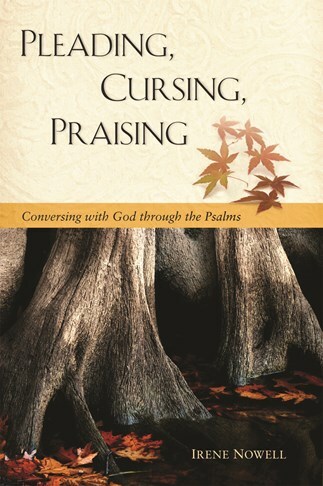 Pleading, Cursing, Praising: Conversing with God through the Psalms is an immensely readable book which is an encouragement to anyone who seeks guidance in the use of the Psalms as a personal prayer tool. Though it is a scholarly treatment of the Psalms, this book of less than 100 pages is the most practical guide this reader has found. For those serious about understanding the Psalms and using them to enrich their prayer life, this book is an invaluable resource. No one knows the psalms better than Irene Nowell. She knows them under the microscope as a scholar, but more importantly she knows them as a friend with whom she has been getting together every day for years. Her anecdotes and examples light up even the cursing psalms. Nowell's life-long love of the psalms and her scholarly work in interpreting and translating them provides grounding for understanding the Psalter's character, structure, history, theology, and function. Readers become more aware of the bonds that connect all-humans and all nature-in community. This book will be a fine companion for any who wish to learn the psalms.